Conservatives hate "It Takes A Village." 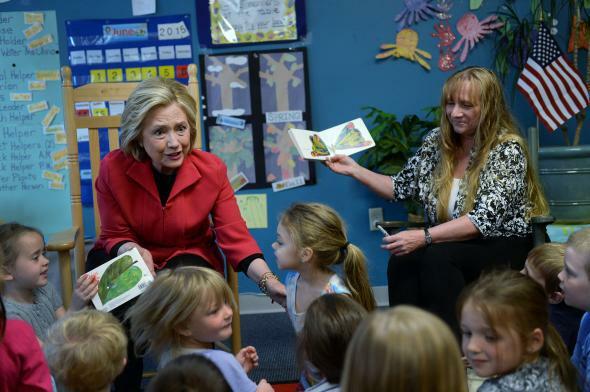 Hillary Clinton embraces it by endorsing universal pre-K.
Hillary Clinton fulfills right-wing nightmares by speaking directly to children at a June 15 event in Rochester, New Hampshire. This week, Hillary Clinton rolled out the first big policy proposal of her campaign: universal prekindergarten. Building on the Obama administration’s work on preschool for all children, Clinton endorsed programs to make affordable preschool available to low-income families and offer tax cuts to middle-class families with preschool children. Doing this would help the country “invest in our most important assets, our children,” Clinton explained. On its surface, this announcement seems like no big deal. Research shows that preschool is good for kids, and struggling to pay for child care is a major issue for working parents. But this move is bolder than it might look, because universal pre-K touches on what may be the hottest button for Hillary’s haters on the right: their fear that she’s out to undermine paternal authority at home. Conservatives love sneering at Hillary Clinton for titling her 1996 book of child advocacy It Takes a Village. (The title is based on a vaguely sourced proverb, “It takes a village to raise a child.”) The American right went nuts over the name, interpreting it as a broad attack on the nuclear family and parental rights to control your child’s upbringing, and even an implicit endorsement of mothers returning to work instead of being housewives. Bob Dole gave voice to this fury when he gave his acceptance speech at the 1996 Republican National Convention. “And after the virtual devastation of the American family, the rock upon which this country was founded, we are told that it takes a village, that is collective, and thus the state, to raise a child,” he said, as the crowd jeered. “And with all due respect, I am here to tell you it does not take a village to raise a child. It takes a family to raise a child,” he continued. Since then, taking swipes at “it takes a village” is right up there with “Al Gore invented the Internet” and cigar jokes about Bill Clinton. “The town doesn’t raise a child, village, or what have you,” groused Rush Limbaugh in 2009, 13 years after the book was released. “That was just code word for the parents don’t really matter.” Andrea Tantaros was blaming the phrase for teen sexuality on Fox News in 2013. It’s such a common phrase in conservative circles that Jonah Goldberg felt free to use it without context in a National Review article swiping at Clinton for hiring consultants to craft her image on the campaign. So this announcement can be read as a “come at me, bro” gesture, inviting her opponents to expose her secret desire to take your kids away to be warehoused by the government. It suggests, yet again, that Clinton is going to run a bold campaign, embracing feminism and liberalism instead of trying to run away from right-wing accusations of radical feminism—accusations that will fly no matter what she does anyway. It’s a smart move. Sixty-four percent of mothers with children under 6 work outside of the home. Most of them are too worried about paying for child care to pay attention to lurid right-wing fears about the end of the nuclear family.